We recently got the opportunity to talk with the energetic and passionate Leah Borromeo, director of an incredible documentary-in-making, “The Cotton Film: Dirty White Gold.” The film aims “to make ethics and sustainability in the fashion industry the norm, not the exception, by making the supply chain transparent.” As they uncover the truth behind Dirty White Gold, you can be part their success by backing up the film’s crowdfunding. 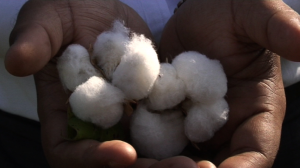 What was your starting point for highlighting such a large issue as the cotton industry? I was invited by a friend to a small demonstration against Bayer in 2009. They manufactured a pesticide called endosulfan – noted as a Persistent Organic Pollutant – which gave people cancer, malformed births, brain oedemas and other nasty things. Because it never leaves the earth, traces of it have been found in polar bears. Afterwards in the pub, I found more info on pesticides and decided to write an article about them in relation to fashion. After that was published, I was invited on a junket to India to see the whole supply chain. I brought a camera and that’s where I found out about farmer suicides. What support have you gotten from the fashion industry in making this film? Lots of support from the likes of the Ethical Fashion Forum, designers like Alexandra Groover and GoodOne and THTC – mainly designers, writers, fashion forward types who have been banging the drum for sustainability and ethics for years. It’s early days and we’re only a small team – so we haven’t gone in for much bigger fish like some of the larger design houses. Yet, we’ve not yet finished filming, hence the crowdfund. How aware are designers of the issues you highlight in the film? Designers like to pride themselves with being ahead of the curve. So many have said they know about sustainability, but only as a buzz-word. I want to use the film to give these buzzwords stories and lives to pin them to. You visited both the fields and factories in India to the catwalks and high streets on London. Talk about the juxtaposition of the two experiences. It made me scrutinize what we wear. Ethics and sustainability is generally ignored by the tastemakers in fashion. Some labels might pay lipservice to it, but the labels that really matter still don’t appear to give much of a toss. Where everyone gets a living wage and doesn’t have to kill themselves to get out of debt. Where subsequent generations don’t fear waking up in the morning to a world of unfairness and corporate subsidy. Hitting our crowdfunding target then going back out to India a couple of more times to follow our characters. Finally, raise the money to finish post-production and distribution. You can read Leah’s favorite story of hope here. Be sure to show your support and spread the word.